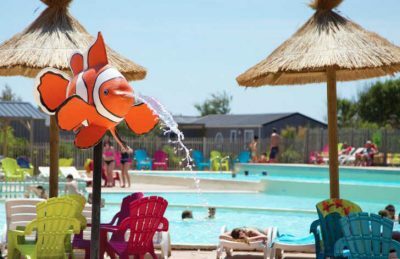 Le Beach Garden is an excellent 5 star quality campsite that occupies a wonderful position and is perfect for those families looking to relax in the south of France. Surrounded by a lovely woodland and set within beautifully landscaped grounds, Le Beach Garden is a haven of peace and tranquility. A variety of different trees, shrubs and plants not only give shade from the warm summer sun but also protect against the coastal breeze and provide a real luxurious feeling. If you’re looking for a lively campsite than you’ve probably already guessed that this is not the place for you. There are not a huge range of activities on site but what Le Beach Garden does have is a really pleasant atmosphere, great facilities and a brilliant location. Those of you who prefer to experience life outside the campsite won’t be disappointed. There are a great range of places to visit and things to do nearby and the resort of Marseillan Plage lies just 500m away where you can find a whole range of restaurants, bars, shops and nightclubs. If you’re looking for a campsite near to a beach then you’ll probably guess from the campsites name that it benefits from direct access to a beautiful sandy beach. Long, sandy and extremely family friendly, the beach is perfect for families with lots of space to relax, swim, play in the sand and sunbathe. Along with the excellent beach, Le Beach Garden campsite also boasts a lovely swimming pool complex that has a lagoon styled pool, a variety of other family and children’s pools and a lovely sun terrace where you can sit back and relax in the sun. Le Beach Garden campsite offers a comprehensive selection of activities and facilities on site and also nearby to ensure you have a fantastic family holiday. On-site activities at Le Beach Garden campsite include table tennis, volleyball, basketball, mini golf, pony rides, badminton, boules, trampolines, playground and cycle hire. Facilities available at Le Beach Garden campsite include WIFI, restaurant, takeaway, bar, groceries, games room, animation team, washers and dryers. Accommodation at Le Beach Garden campsite includes a range of 2 and 3 bedroom mobile homes and tents that are available from Eurocamp and Al Fresco Holidays.